The Matrix of World Travel: Israel: The "Ultimate Solution"
We're back at Heaven’s Theater where God is getting consulting advice from world famous explorer, Rich Birecki. We join them live as they continue their conversation about Israel. God: So you made it to Jerusalem. Rich: Where the first cab driver I met promptly charged me ten dollars to drive me two blocks, dropping me off at what he assured me was a cheap hotel, which in fairness to him, was only $500 a night. I ended up walking around for a couple hours before I found something in my price range. God: So, what did you like best about Jerusalem? Rich: The sense of history that is there. You just automatically have a feeling that a lot of interesting events have transpired there over the years. Rich: What am I, a historian? God: What did you like least about Jerusalem? Rich: God. Take a breather, slow down, let me explain. Rich: Look, I love Jewish people, like I love Christians, Muslims, Buddhists, … maybe not Satanists, but you get the idea. What I don’t like are religious nuts. God: They always pray for such “interesting” things. God: That’s one of them. Rich: Look, in any religion, the 1% die hard, “true-believers” create 99% of the havoc, and 99% of the Jewish 1% are concentrated in Jerusalem and Israeli settlements. God: People have freedom to choose in what way they devote themselves to me. Rich: Agreed, but not according to the right wing of any religion. You worship as they worship or else you are damned, beneath being spoken to, or an infidel worthy of only death. These people speak of God every other word, but have never experienced. They spend so much time pounding the pulpit, posturing, trying to convince others, and by extension themselves, that their ultra-rigid belief systems and traditions are the only way to God, that they lose sight of what they are truly seeking. God: And what are they seeking? Rich: What is all around them. The energy that they were born from, that they are now, that will be here long after “they” are gone. Rich: Yes, that which people call you by name, often misguidedly thinking of a man on a cloud with a long white beard. God: You can describe that which I am? Rich: In words? … I’ll do my best … there are times the mind lets go of incessant thought; in moments of great inspiration, when in the presence of profound beauty, or witnessing immense power in nature, when feeling unbridled love, or a moment of opening in meditation, there are so many ways; and in these moments you realize God- as a divine joy and love that burns so fiercely in every cell of the body, thinking becomes pointless, and everything just seems brighter. Most people have experienced this at some point, but haven’t known what to call it. Presence, God, divinity, pure love are all apt. God: And you experienced this in Jerasulem? Rich: You can experience it everywhere; Rodeo Drive in Beverly Hills, Jerusalem, the slums of Mumbai, India where there are streams of sewage flowing in and out of twenty foot high piles of trash people live in. It makes no difference where you are, all land is "holy." Even land in the middle of the desert. God: You do know that people of the Jewish faith have been persecuted over the years, not allowed to practice their religion, and that the ancestors of these people came from the land now called Israel, and that Israel was the one place where they believed they would be free to worship freely? Rich: Of course. And Israel exists today. That’s a fact. Everyone clamoring for its destruction based on historical precedent might as well shut-up, cause the majority of humans alive today have never known a world without Israel. The statute of limitations is up. Conversely, there are people arguing that those practicing the Jewish faith have an inherent right to “all their former lands” because they were there first, thousands of years ago. You think the city of New York is going to up and move because the descendants of Indians start yelling, “You killed our people, stole our land, and we were there first!” Its true, but it isn't going to and shouldn't happen. God: And what of Biblical prophecies? Rich: Look, I don't want to get into the specifics of any Holy Scriptures, because "believers" hold onto the "word of God" like they are clinging to the edge of a cliff over a 500 foot drop. Most would be willing to kill you before letting go; some sick form of egoic self preservation. What's undeniable, is that history shows us numerous examples of clashing interpretations over the same words these books contain, and various "Messianic" leaders who have twisted these words to manipulate lesser minds for their power and financial gain. How many millions and millions of people have been slaughtered over the Centuries in the name of "God?" ... So to answer your question, when right-wing Jews use passages from scripture to assert their right over a piece of land, to put it euphemistically, I'm dubious. God: Not all Jewish people are right-wing. Rich: Of course, and by discussing religion in this light, in the context of Israel, I think that most Israelis are getting raw deal here. I don't think the right-wing Hasidic and Ultra-Orthodox people of Jerusalem represent the average Israeli. Unfortunately, they were the majority of people I ran into while in the city. God: Okay, that stated, what did you observe that left you so aghast? Rich: Well, I arrived in Jerusalem during a religious holiday. After checking into my hotel, I went out onto the streets and observed a very festive atmosphere. Music was playing, men were dancing atop cars, men were dancing in a circle passing a Torah around ... Wait a second, where are the women? Was I witnessing a Jewish gay pride parade? It turns out that under orthodox law, men and women aren't allowed to dance together. I was attending the ultimate sausage fest. God: Surely there is a reason ... isn't there? Rich: If the opposite sexes were to touch there would be a transference of impurity. It's good that I can explain this to you God. God: Are you sure that's correct? It doesn't make much sense to me. God: What about the fox and sable hats? Rich: Don't get me started on those donut shaped fur hats they wrap around their head like some gigantic NBA headband. They are made out of fox fur or sable and cost $5,000. I was told that they are generally worn to show their ultra-conservative political leanings more than anything. Is there any bigger way to demonstrate your desire for separation than to sink five thousand into a headband? My Jewish friend refused to spend the overpriced $2 it would cost to call me while we were traveling in Prague together, creating the loss of an entire afternoon for both of us, I couldn't imagine trying to sell him a hat for 5k. Interestingly enough, there is a movement in Israel seeking to ban the sale of all fur products that is being opposed, by you guessed it, the ultra-Orthodox community, who believe it is their religious right to worship as they want, even if it means violating the forward thinking Jewish religious law that strictly forbids cruelty to or unnecessary suffering of animals. So is it really about Religion, or your ability to maintain your rigid Orthodox identity by wearing a hat that costs $5,000? This is a perfect example of people using scripture as it suits them, and re-interpreting or denying parts that might not. 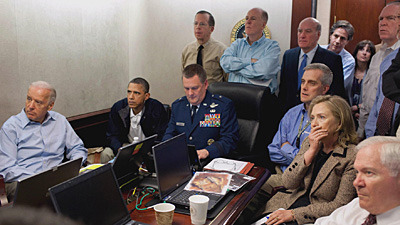 God: How did the Ultra Orthodox react to Osama Bin Laden's death? Rich: Why did they edit her out? Because they were afraid they would be breaking a religious law against "titillation" for lack of a better word. Seriously? Hillary Clinton? Can you live any more in fear that you are impure or angering God. These people are nuts. God: Okay, okay, we get the point already, don't belabor it. Rich: Well look, rigidity of ANY belief system, organization, or political structure will ultimately lead to its demise. The United States has been held together in part because the Constitution is malleable. Houses are specially constructed in Japan to bend so that the structures might survive earthquakes. Rigidity gives the impression of being long lasting and solid, but these structures break down all at once. Just look at the former Soviet Union as an example. God: Does this show up politically in Israel? Rich: The Western Wall is the last in tact remnant of the ancient Jewish Temple, and it is believed to be a place where prayers are more likely to be answered, so you can imagine the importance placed on it by the religious right. Behind it is the Temple Mount, a holy site for Muslims around the world. There is a significant segment of the Israeli right-wing advocating that it would be in Jewish interest to annex the land of the Temple Mount, tear it down, and rebuild the Jewish Temple atop. 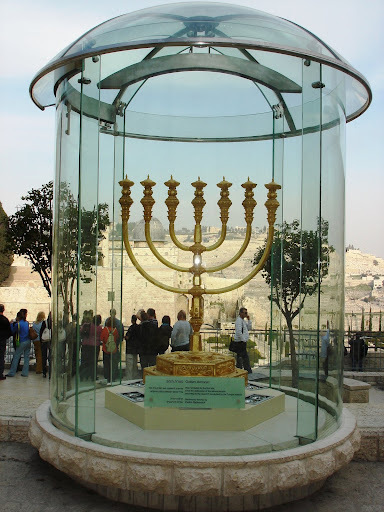 Of course, the cost of asserting this "biblical/hereditary/mine mine mine right" would be a cataclysmic war, but if you doubt the sincerity of their convictions about this subject, many costly, giant objects, like the minora on display below, have already been created to decorate the rebuilt Temple. God: So, you are telling us the problem, what's the solution? Rich: A calming of the human ego and its need for identity. You'll notice most of the times I state, "people practicing the Jewish faith," that is intentional as most people say, "I am Muslim, Jewish, tall, short," and yes, it can be short hand to describe your general beliefs, character, etc. but it it is usually the basis of identity, and that which threatens identity is reacted to by the mind with nearly the same intensity as a life and death situation. All war, terrorist actions, violence, and hatred stem from egoic identity in way or another. When you are in a state of deep love or joy, as I stated before, identity for a moment disappears, and the thought of inflicting pain on someone else becomes alien. God: So people should just live in joy and love every moment? That's your solution? Rich: Absolutely ... Let's skip all the politics, every possible solution to the Palestinian/ Israeli problem has already been suggested, and sadly, moderates on both sides are being held hostage by the zealots. A leader is supposed to at least have a glimpse of an ultimate vision. I'm sure some people would say, "stupid, impossible, impractical," etc etc. and it doesn't help that as human beings we are a long long long ways from achieving this, but that sir, is my "Ultimate Solution." Seriously, I realize that some of you might have a different perspective about what I have posted. If you do, and you can state in a measured and reasoned voice, I would be interested to hear it. Put it in the comments below/email me/subscribe to the blog.